Winner of the Pulitzer Prize for Fiction and Richard and Judy pick. From the author of the acclaimed ‘Year of Wonders’ and ‘People of the Book’, a historical novel and love story set during a time of catastrophe on the front lines of the American Civil War. Set during the American Civil War, ‘March’ tells the story of John March, known to us as the father away from his family of girls in ‘Little Women’, Louisa May Alcott’s classic American novel. 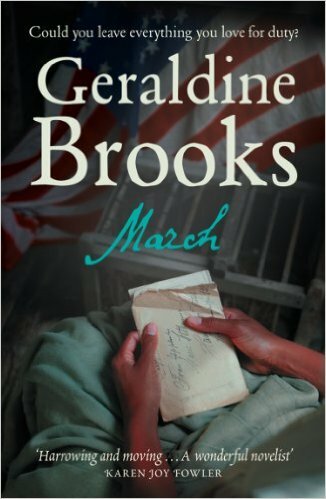 In Brooks’s telling, March emerges as an abolitionist and idealistic chaplain on the front lines of a war that tests his faith in himself and in the Union cause when he learns that his side, too, is capable of barbarism and racism. As he recovers from a near-fatal illness in a Washington hospital, he must reassemble the shards of his shattered mind and body, and find a way to reconnect with a wife and daughters who have no idea of the ordeals he has been through. As Alcott drew on her real-life sisters in shaping the characters of her little women, so Brooks turned to the journals and letters of Bronson Alcott, Louisa May’s father, an idealistic educator, animal rights exponent and abolitionist who was a friend and confidante of Ralph Waldo Emerson and Henry David Thoreau. The story spans the vibrant intellectual world of Concord and the sensuous antebellum South, through to the first year of the Civil War as the North reels under a series of unexpected defeats. Like her bestselling ‘Year of Wonders’, ‘March’ follows an unconventional love story. It explores the passions between a man and a woman, the tenderness of parent and child, and the life-changing power of an ardently held belief. Cover – The flag, the old letter and the strapline ‘Could you leave everything you love for duty?’ all point towards a war time story. The book title is slightly overshadowed by the author’s name but is still visible at thumbnail size. March is told largely in the words of Mr. March, father of all those “little women,” and it encompasses the year that he spent as a Union chaplain during the early part of the Civil War. Ever the idealist, one who at times refused to recognize the demands of the real world or to compromise his principles in order to better get along with others, March quickly managed to get on the bad side of both the men to whom he hoped to minister and that of his superior officers. As so often happens during war, March lived a lifetime during his one year of service, a year in which he learned more about himself than he really wanted to know. He came to realize that his ideals and principles did not necessarily come with the courage to do the right thing when to do so put him in personal danger. He ended his year a broken man, one barely alive and, more importantly, one who considered his year of service to have been a disaster for himself and everyone he tried to help. Along the way, March unexpectedly finds himself revisiting a plantation he remembered from his days as a young traveling salesman trying to build the nest egg he hoped to invest for the remainder of his life. Some twenty years after his first visit, the home is now an emergency hospital for Union troops and life there is nothing like the one he remembered from before. But one thing has not changed. Grace Clements, the mulatto slave woman he was so attracted to on his first visit, is still there and he is still powerfully attracted to her. Grace Clements comes to be one of the two most important women in March’s life, in fact. Having so consistently irritated the troops to whom he was assigned, March is assigned to spend the bulk of his war at a cotton plantation teaching liberated slaves to read and write. This is my one quibble with the book. While, in fact, some southern cotton plantations were leased to northern entrepreneurs during the war so that much needed cotton could be brought to market for benefit of the North, this did not occur nearly so early in the war as portrayed in March. Despite the fact that the heart of the story takes place on this plantation, I could never completely forget just how unlikely it would have been for March to find himself on such a plantation during his particular year of the war. But that’s a minor thing because March has so much to offer. It is filled with the kind of period detail that marks the best historical fiction and fans of Little Women will very likely find it to be the perfect companion piece to one of their favorite novels. BUY or PASS? – It’s not for me, so it’s a PASS this week. March – buy your copy. Doesn’t really grab me, so it’s a pass this time. The cover is ok, but doesn’t grab me a pass today. The cover doesn’t do it justice, nor the review. Her writing is fabulous – I’ve read it twice! I think this would be an interesting read actually but at that price for an ebook it’s a pass from me, I have too many others baying for my attention on the kindle already. Think I’ll pass also – not much for love stories. The cover does not grab me either, although I do like wartime fiction. I agree the author’s name takes over the cover!